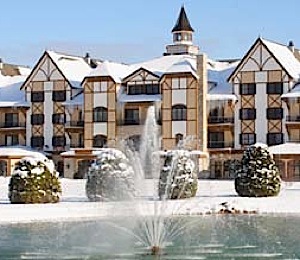 Boyne Falls: Boyne Mountain, a Northern Michigan golf and ski resort, offers lodging options from hotel rooms to Austrian-themed houses and chalets. Slopeside and golf course lodging available. The Grand Mountain Lodge and Spa offers 220 hotel rooms as well as one-, two- and three-bedroom suites. Select units sleep up to ten. Family suites available. The lodge is located within walking distance of the slopes. Avalanche Bay Indoor Waterpark is a complete waterpark with slides, a lazy river and a Flowrider. This four-season Boyne Falls resort has it all: exemplary skiing and outstanding golf, horseback trail rides, sleigh rides, disc golf, a zipline adventure course, paintball, kayaking and canoeing, the state’s largest indoor waterpark, and the award-winning Solace Spa. When playtime’s over and you’re ready to gather your crew, there’s more than 37,000 square feet of event space, plus freshly upgraded AV equipment as of June 2016.